What are the Top Rated Dishwashers? So you’re thinking about purchasing a new dishwasher and you’re not entirely sure what the top rated dishwashers are or which ones are best for you. Is it a small and quiet one or a large one that can handle the load of multiple cups, plates and dishes all at once? There are a variety of dishwashers to choose from and it can be hard to determine what is the most suitable. You’ll want to first evaluate your options based on your current living situation. First and foremost you should determine if getting a dishwasher is the best choice for you. Do you have the need to purchase one in order to save time or is the chore of washing dishes becoming too difficult due to the large number of dirty cups and plates? After you have established that a dishwasher is a wise investment for your home, there is still more work to be done. Establishing what to look for in this dishwasher will create a much easier transition and ensure that it performs to the best of its ability in your home to not only produce cleaner and shinier cups and plates but also provide less work for you. 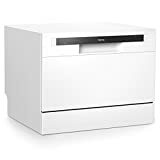 Below we have reviewed the best-rated dishwashers so you will have an idea on what’s on the rage in the market and what customers are saying about each product. Space savers won’t have trouble with this dishwasher as it can be easily placed on top of countertops and cabinetry with ease. You can also insert it inside cabinets for a full built-in look. It is considered as space saving as it fits in most standard designs of cabinetry. Features: This SPT dishwasher is very economical because it features a design that is energy-star efficient. It has six wash cycles that effectively cleans all types of dishes and is housed in a sleek silver finish that integrates well for a contemporary designed kitchen. The interior is made of durable stainless steel that won’t be affected by constant washing. PROS: This dishwasher is very easy to set up; everyone can easily do it even without prior background with this kind of stuff. You’ll need a few tools to connect the dishwasher to the major water source and drainage, but nothing difficult to acquire. This is perfect for small kitchens and perfect for a small family of about four. It also runs very quietly; sometimes it will make you wonder if it’s really running as it should, so you’ll be surprised. All wash cycles also do a pretty good job at cleaning dishes but be warned that the heavy-duty wash takes ages to finish. So if the dirt on your dishware is minimal, don’t use that setting. CONS: This is great for apartment living where there isn’t too much space and for only about two to four people. If you have a bigger family and often invite people over for parties, don’t waste money getting a countertop dishwasher because you clearly need more space. The built of this dishwasher is compact and the racks are fairly small so it won’t fit a lot. This dishwasher features a very sleek metal design that would look really neat in modern-designed kitchen. It looks like a smooth matte and can be inserted in between cabinetry and countertops. It also comes with six standard place settings so you’ll have the desired wash depending on the type of dishware. Features: It only stands over 17 inches tall so you can easily insert it to cabinets to save some space, especially if you have a relatively small kitchen. It is also very compact and sturdy so you don’t need to worry if it’s built to last a long time. You’ll also be able to save up energy, as it only consumes 200-kilowatt hours per year, about 61% less than similar countertop dishwashers. PROS: The EdgeStar dishwasher features an LED display with full digital controls, which include child lock, six wash cycle programs, and a delayed start feature so you can wash dishes when you want. The interior also features durable stainless steel finish that will endure against rust and corrosion. A powerful spray arm is found inside the dishwasher, capable of deep and thorough cleaning of your dishware. If you worry about water spotting, this dishwasher has a way of avoiding that through the built-in rinse agent. An internal water heater also protects your dishware against germs and bacteria. Your dishware is also easy to organize as the racks come with a cutlery basket and cup shelf. CONS: Like the previously reviewed countertop dishwasher, this one is only good for small families of two to four. If you intend to place more than it could carry, you will be disappointed as it won’t be able to thoroughly clean your dishes. Larger dishes might not also fit, especially very wide pots and pans. This 24-inch wide built-in dishwasher is made up of stainless steel interior and exterior, giving it a luxurious look and feel. It is perfect for kitchens with minimal space as you can insert it in between cabinetry and cupboard. Once in, it’s looks very classic and well integrated. Features: It has four wash levels and five wash cycles. 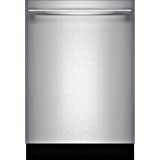 Whether you’ll want a quick wash, a deep wash, or a sanitized wash for baby bottles, you’ll have it in this dishwasher. There are three racks that can fit in most of your dishware, pots and pans. This is definitely recommended to be used by a large family, compared to the countertop ones reviewed above. PROS: Despite having a large size, this dishwasher is so quiet that you won’t be able to know if it’s still running or not. Good thing, there is a red light indicator that shines on the floor when it is operational. It also has a complete installation kit with manual so anyone can easily set it up. Dishware, pots, pans, and glasses washed with any cycle come out clean and spotless, without any water stains. For additional peace of mind, it comes with a leak detector and tray to prevent damage from water leaks. CONS: If you have a small kitchen and have problems with counter and cabinet space, you might find that this dishwasher is too big to your preference. It is wide that it would take up one space of a counter. Also, you have to ensure that you have soft water; otherwise, your dishware will come out with water stains. This isn’t the fault of the dishwasher. This built-in dishwasher comes in three colors/finishes: Black, Stainless Steel, and White. The interior is fully lined with durable stainless steel material, great for conducting heat effectively and avoiding corrosion. Features: This dishwasher has a 2-4 hour delay start options so cleaning the dishes will be up to your desired schedule. The Energy Saver Dry options also allow the dishes to be dried without the heat, which is a good start for going eco-friendly. It is also pretty quiet so there would not be any disturbances while operational. PROS: Installing it is also pretty straightforward. With the manual and all the stuff needed, everyone can efficiently set it up even without prior background to stuff like this. It also cleans well; any type of wash cycle you choose will result to sparkly clean dishes. The racks also provide enough space for all the dishware a family of five or more uses. CONS: Make sure that you have enough room in your kitchen to house this dishwasher. It’s bigger and wider than most compact dishwashers so you need to have space for at least a standard-sized counter, preferably near the sink where the water line and drain connects. This portable dishwasher comes with wheels so you can easily move it around the house when you need to. You can push it over in between two cabinets or countertops so it would give out a look as if it’s in-built, or make it freestanding if you don’t have that luxury of space. Features: It comes with six wash programs: All-in-1, Heavy, Normal, Light, Rinse, and Speed. 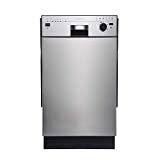 Like most dishwashers reviewed here, it also has a durable stainless steel finish inside and an adjustable rack to accommodate large dishware. PROS: Because it is portable, it features quick-connect to any faucet that eliminates permanent installation and direct plumbing. It has time delay options so you can start the cleaning when you want to, error alarm, and rinse aid warning indicator. It is also very quiet when operational and has a fairly large capacity, perfect for big families. CONS: This dishwasher doesn’t have the option to heat-up and dry your dishes. If you want to get something with a heating element that can instantly dry dishes after washing, find other brands that have this option. For this particular model, you have to take out the dishes and let them air-dry. Key Takeaway: Make sure to create a checklist of some brands and models to try and review each one of them if it fits your budget, needs, and wants. Buying one is not a daunting task, choosing which one to buy is. What should I look for in a new Dishwasher? There are a lot of factors that you should look into when selecting the best dishwasher for your home. It’s easy to mistake one dishwasher as the same for all dishwashers, and assume that you just need to find one that looks good and seems to clean dishes well. That is notecase; each dishwasher is different and will change in suitability according to your situation. There are a variety of different styles of dishwashers, with some having more aesthetic differences than others. The style you choose should definitely relate to your situation, dependent on how you’ll use it and if there is enough to accommodate he varying features that different dishwasher contain. The standard size is a roughly 60cm x 60cm, with a hinged door and around 80cm in height. Semi-integrated is as the name implies; partially integrated with a custom door. Fully integrated are dishwashers completely installed into the kitchen area, and there are also dish-drawers, which are disguised as slide out drawers. Finally there are slim lines for narrow spaces and also bench tops. The features of the dishwasher are the most important part, as they are the way in which it operates and will accomplish the tasks that are set for it. There is more to a dishwasher than just stacking and cleaning, so it is equally important to know what your chosen top rated dishwasher can do before making a purchase. Most good quality dishwashers will have different settings on how it performs its clean. A lower strength setting for glassware or an express setting for quick cleans can be expected. There may also be more specialized settings to allow for different types of cleaning, as well as custom options if you’re one for more control over your appliances. Alongside the features you should also confirm that it comes with a silverware basket. These are key items that should come with every dishwasher, allowing you to place your cutlery in for cleaning without having to worry about it getting jammed up in an pipes or striking against any rotating blades. Energy conservation has become one of the biggest talking point of electronics and household appliances over the past 20 years as more and more people are becoming aware of our own impact on the environment. This may urge you to make a conscious decision on your own appliance usage, which manufacturers take into consideration. You can find dishwashers and other appliances that are designed to minimize the amount of energy that they consume in order to save you money, whilst also maximize their efficiency. In some cases the manufacturer will also list the energy rating on their official website, in the product details or place it on the product itself. It is safe to assume that if there are no indications on the dishwasher, or any on official documents relating to the product, that there has been little consideration given to the energy efficiency of the dishwasher. This may be a factor that will ultimately deter you from purchasing that dishwasher overall. Another issue that ties into the increasing idea of minimizing our impact on the world and also costs, water conservation is mentioned on the product indicating how many Gallons or Litres are consumed in a single washing cycle. Most dishwashers are being improved to use up less whilst maintaining a high standard of cleaning quality. Once again it is safe to assume that if there are no indicators then the product has not been created with the intention of being conservative. This is a negative factor to avoid as it can cause problems in the long run related to the overall use of the dishwasher and also the cost of use as more and more people are feeling the hurt of an increase in the cost of living. Purchasing a small sized dishwasher might leave you with a top rated dishwasher without a top rated location for it, effectively making it a waste. It is a good idea to purchase a dishwasher that can fit in the allocated location that you have for it, so you can maximize its use whilst also minimizing wasted space. The size you choose should also be dependent on how many dishes and cups you intend to clean on a regular basis; it may be prudent to purchase a large dishwasher for a large family instead of a compact one. As always before purchasing you should know the dimensions of the space you will be installing it so that you know it will fit well and cause no problems because of its size. This may not be a very influential factor, however it is something that you may just want to know more about in case it become a bigger issue after you purchase your dishwasher. Some dishwashers are capable of cleaning and washing dishes faster than others, whilst others provide a slower and more thorough rinse. In other cases, you can purchase dishwashers that can vary in their cleaning speed depending on the amount of dishes you have in them at that moment. If you foresee that you will need to wash many dishes a lot, a faster dishwasher is better. However in most cases we simple leave it and forget, therefore eliminating the speed as an important factor. In some homes the kitchen and food preparation area is close to a dining area or a lounging area. Is your kitchen area close to those mentioned before? Have you considered the noise that your dishwasher will make when it is operating and you’re trying to relax with some well-earned peace and quiet? These days the sound quality of dishwashers is improving, however there might be a few that can become quite noisy, especially when they are larger and provide a more thorough clean. Establish where you will place your dishwasher and how often you may use it. Noise can often be determined by checking the item specifications of the dishwasher you want. Dishwashers are in no way a cheap appliance, with the top rated dishwashers ranging from $400 to easily over $1000. With that in mind, a $1000+ dishwasher might not always be the best dishwasher for your home. It is perfectly reasonable to purchase one for slightly cheaper that is still extremely efficient and completes all tasks you require it to. Set yourself a budget with some form of buffer, which you will extend if you see a dishwasher that has all the features you want. There may be a situation where you see a similar design that offers all the features you want but is a little bit more expensive. Allocating a price limit will allow you to accommodate for a change whilst also keeping your expenses controlled. In most cases the dishwasher should come with at least 1 year of manufacturer’s warranty; however it is important to verify further. Some manufacturers offer more than 1 year, whilst some may not. Consider the quality and brand name of the dishwasher before deciding to purchase without any form of warranty. When you do decide to purchase, it is strongly recommended that you purchase with extended warranty if possible. Dishwashers can become expensive tools and you want to ensure that through their constant use you are covered if any issues should arise. The fact that it will be used a lot should be more than enough reason to insure it. Key Takeaway: Ensure that the factors listed above fall on your chosen dishwasher, otherwise, you might not be completely satisfied with it. All these factors are important in the long run as you want to be able to make it usable for years to come. Dishwashers are expensive tools and you want to ensure that you have found your perfect one on the first go. Deciding for the best one to buy is not an easy feat, but if you have given a lot of thought on it, you’re bound to get one that will make you feel contented.